Looking for a fall side dish to add to your table? 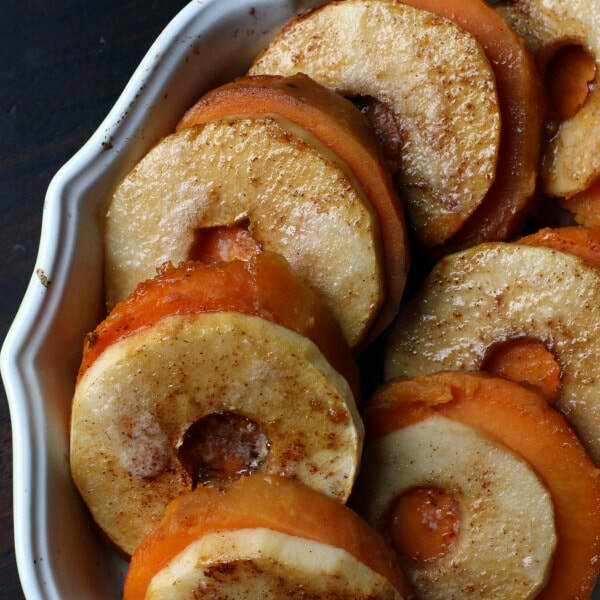 These Baked Apples and Sweet Potatoes are loaded with nutrients like Vitamin A. They are also flavored with spices, which helps to keep the added sugar low. Preheat the oven to 400°F and grease a casserole dish with oil. Peel 5 sweet potatoes and boil them in water until they are almost tender. Let cool, then slice them into ¼ - ½ inch rounds. Peel the apples. Remove the cores and slice the apples. Put a layer of sweet potatoes on the bottom of the dish, then a layer of apple slices. Combine sugar, salt, and spices in a small bowl. Sprinkle half of the mixture onto the first layer of sweet potatoes and apple slices. Repeat with another layer of sweet potatoes and apples, adding the rest of the sugar mixture on top.